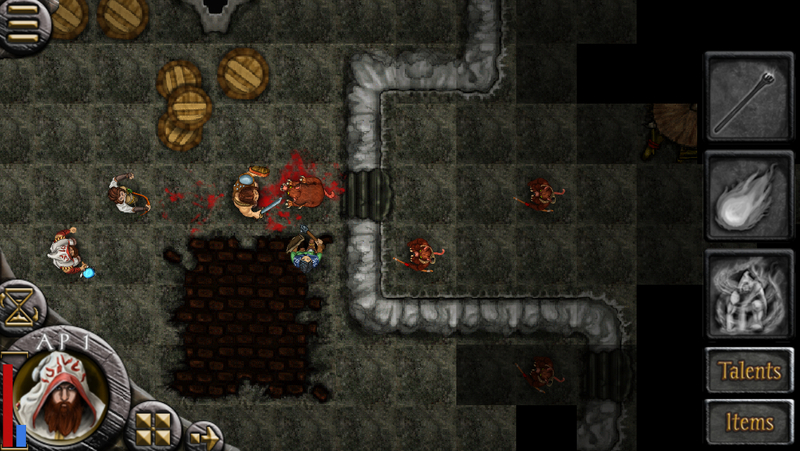 In my recent review of Hoplite ($2.99), I mentioned how the game benefited from a focused design. It’s vitally important when the team is small to avoid biting off more than you can chew, because you might end up with a game full of content of wildly varying quality that doesn’t measure up as an overall experience. 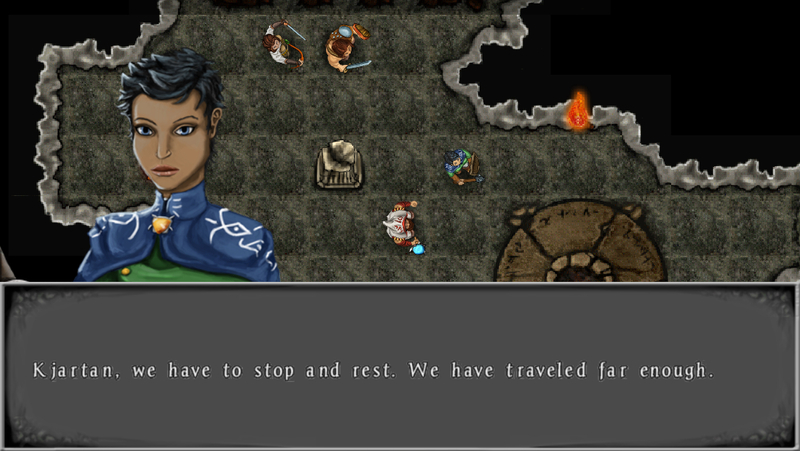 This is unfortunately the case with the Trese Brothers’ latest, the fantasy strategy RPG Heroes of Steel (Free). The aspects of the game that are the most fun would have benefited from the extra resources that were spent on things that don’t work well at all. Specifically, the turn-based battles are very solid, but almost everything between them is a slog. If you have the patience to deal with or embrace the slower bits, the game is without a doubt a good value for its content, with the free prologue spanning about five hours alone and the promise of more to come via IAP chapters, the first of which is available for just a dollar. With a lot of competition in the turn-based strategy genre on iOS, though, it’s hard to recommend spending your time on this one. There’s a huge back story to the game, and it’s clear a lot of careful attention went into building the world. Even the loading screens offer little bits of lore, and even though the writing is kind of stiff, I still got into the tale that the game spins. Your introduction to the world unfortunately comes somewhere around its hindquarters, as you join the story in a dungeon where four adventurers have been locked up. In the beginning, it’s unclear exactly why each of them is there, but over the course of the game, you learn more about what led to that situation. The four unlikely companions break out and attempt to make an escape together. The prologue chapter essentially covers this escape, through the dungeons and connecting caverns. Simply getting out does not guarantee freedom, however, and there are bigger things at work that even the available add-on chapter really just scratches the surface of at the moment with its single act. Initially, unless you buy the extra sorcerer character available via IAP, you have no choice as to the members of your group. The developer plans to add other characters, presumably also as IAP, but, I suspect due to the character interactions, you can’t change your party once you’ve started, so if you want to use them, you’ll have to start a new game. In terms of the starter characters, you’ve got your usual bases covered here. There’s a strong and resilient warrior, a slightly squishy thief with many useful traversal skills, a very squishy wizard who can wreak havoc from afar, and a cleric with an assortment of healing skills and buffs. They are all well-defined in terms of character, with frequent conversations between them revealing their back stories and motivations. You can explore areas by moving around individually or as a group, tapping on the location you want to move to. Certain skills can be used that offer useful benefits like uncovering traps, picking locks, or healing. Battles are fairly frequent, and once you’ve entered one, your moves are limited by each character’s action points. The battles play out like many other turn-based strategy RPGs, with one side moving all of their characters, followed by the other, until either all the enemies are defeated or one of your heroes falls. Each character has a wide assortment of skills they can use in battle, with most of the good ones consuming spirit points that can be replenished with potions or by camping at designated spots. After you’ve cleared all the enemies, you’re once again able to freely explore. At least so far, the game is something of a road trip adventure. You’ll walk around fairly linear areas, characters will talk to each other a bit, a few treasure chests will be found, you’ll have a battle which will clear a path to the next linear area, rinse and repeat. Toss in some camps where you can distribute the points earned from your level-ups and have a few more conversations, and you’ve pretty much got Heroes of Steel in a nutshell. The biggest problem the game has is that the stuff in between battles really drag out. Your characters move almost unbearably slowly when they walk, and look incredibly strange doing it, to boot. The areas themselves aren’t very enjoyable to explore, with lots of similar-looking elements and too many empty nooks and crannies. There are some good weapons and items you can find if you look around, along with some extra battles, but most of the time you’ll find little of use for your troubles. In contrast, the battles are quite enjoyable. 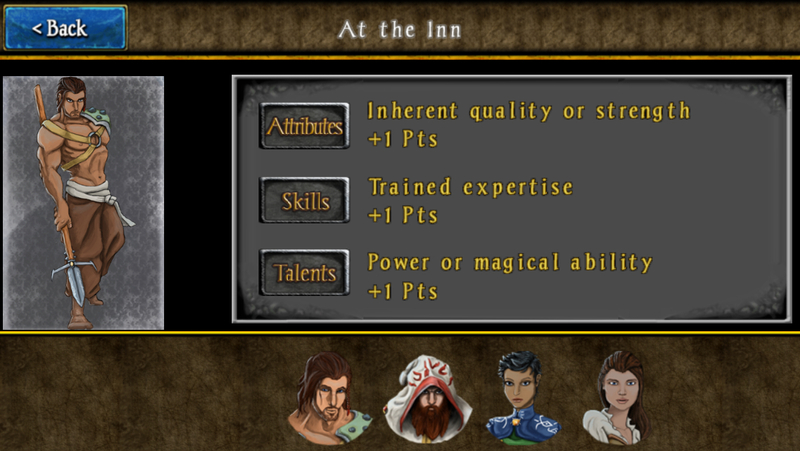 Each character has a good selection of useful abilities, and depending on how you allocate your points on level up, each of your party members can wear a couple of different hats if need be. The enemy AI isn’t terribly hard on the default difficulty, but even there, it will use some genuine tactics when making its moves. Thanks to the small size of your party and the presence of only one natural damage sponge in the group, you really have to be aware of the positioning of friend and foe alike. 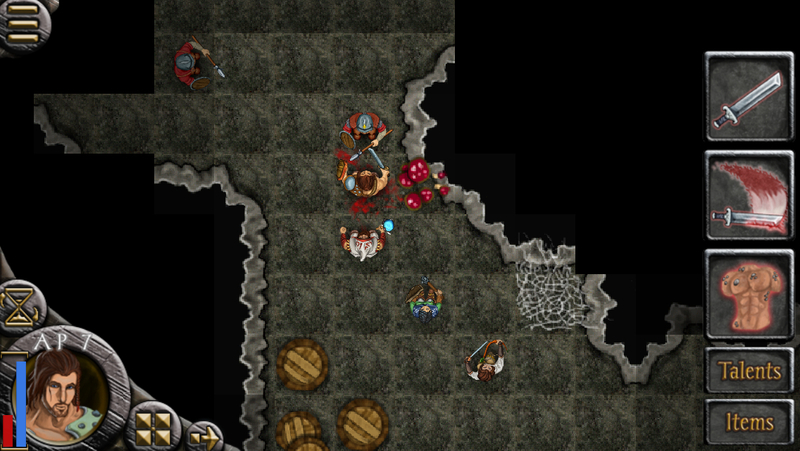 Skillful use of the terrain is a must to create bottlenecks and guard your weaker party members. There’s also a sort of fog of war, which adds another layer of strategy to the proceedings. You need to take care of everyone carefully, because if any of your characters are killed, you lose the battle. Should that happen, you have your choice of redoing the final turn or going back to just before the battle, so you don’t stand to lose too much of your time. The battles are very meat and potatoes type stuff for this genre, and you’ve almost certainly seen everything here before in another game. It’s executed competently, though, so I think genre fans are going to be more than happy with this part of the game, at least. I found myself wishing the game was just a series of battles with the story spliced in between. Most of your time playing will be spent in battles as it is, but the non-battle portions are very dull and drag down the overall enjoyment of the game. All the extra time spent wandering around also contributes to the repetitiveness of the surroundings. You’re almost always underground in this game, and while there are attempts to make things look a bit different now and then, it never gets far away from the dark dungeons you started in. The enemy types are perhaps spread a bit too thin as well, with the Ratkin creatures in particular showing up far too often. The visual experience on the whole is a mixed bag. In addition to the aforementioned lack of variety, the artwork used in the game doesn’t shine all that well. I like the designs themselves, with the characters looking fairly distinctive and not overly busy, the way some fantasy games tend to go, but the character art in the game looks a bit rough. It stands out set against the clean-looking work done on the backgrounds and monsters. The sprites of the human characters look really odd, too. The game uses an overhead camera, and I think there was an attempt here to give a bird’s-eye-view of the characters, but the way they look and move is stiff and strange. The UI has issues, too. A few of your many abilities are placed on the right-hand of the screen for easy access, and you can change them around, but using an ability that’s not in the shortcuts is inconvenient. I feel like the icon sizes could suffer being shrunk a little bit, even on the iPhone’s screen, in exchange for squeezing one or two more on there. The controls for movement for some reason differ when you’re moving as a group or moving individually, with individual movements using a double-click and group movement using a single click, with a second click canceling the command. That’s a really strange inconsistency. I get the purpose of the double-click in battle, so that you don’t burn AP by moving someone inadvertently, but it’s weird that it carries over outside of battle for individual units only. If you’re a strategy or RPG fan, you’ve got nothing to lose by giving Heroes of Steel a try, and it’s certainly got some fans in our forum, but I wish I could recommend this for a better reason than it having a lengthy free component. It’s on the cusp of something really good with the battles, but the lack of variety hurts that end of things the same way it hits the whole game. Meanwhile, the non-combat aspects of the game are kind of dreadful, thanks to the slow speed, weak dungeon design, and stale environments. Things could get better, as this developer is well-known for making major post-release updates to their games, and Heroes of Steel has already had numerous issues addressed in the last few weeks. As for what’s here now, I appreciate that the developers seem to have a big story in mind, and I do hope they get to tell it, but in its existing form, the juice of Heroes of Steel isn’t quite worth the squeeze.